The Tempest line of wireless intercoms comprises the 2.4 GHz Tempest2400 and 900 MHz Tempest900 wireless systems in either a two- or four-channel option. Both Tempest systems deliver RF technologies to ensure interference-free communications for all types of venues. The Tempest2400 offers a Seamless Roaming feature, which provides sound engineers with continuous wireless coverage across expanded production spaces, such as such as college campuses and sports arenas. With the Seamless Roaming feature, BeltStation users can migrate between as many as 16 different Tempest BaseStations (coverage areas or zones) without having to change the settings on their BeltStations. As part of a continuing effort to expand the Tempest system further, Clear-Com is releasing its new PIFA-equipped Tempest900 BeltStation. Increasingly popular in the mobile phone market, the low-profile PIFA has an omnidirectional signal pattern that can receive a connection from any direction. 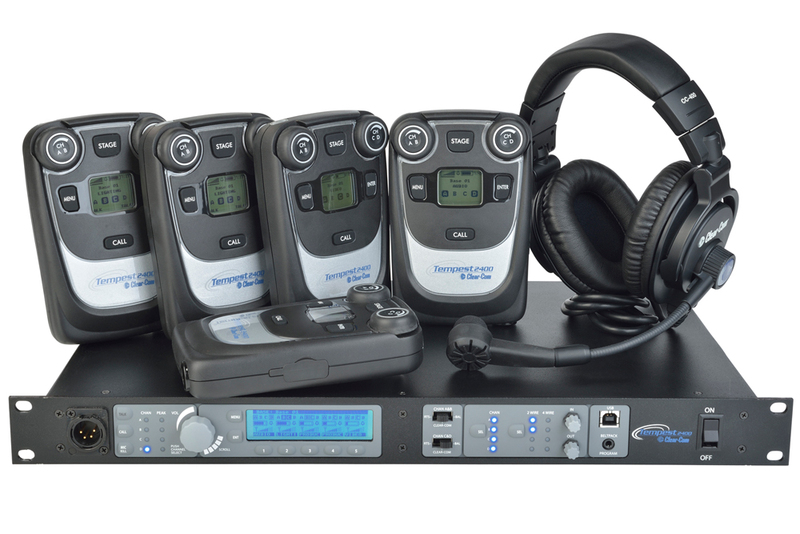 Backward compatible with Tempest900 firmware version 3.0, the new BeltStations are fully compatible with both two- and four-channel versions of the Tempest900 BaseStations and BeltStations. The longer wavelengths and wider symbol width of this band allow the system’s signals to permeate dense walls and other structural objects more easily. This feature increases the range of the system and reduces any potential loss of audio. Clear-Com also unveiled its new Tempest Remote Transceiver Line Extender. One Line Extender increases the systems’ cable run by 3,000 feet, while two or more Line Extenders can increase it by 2,000 feet per Line Extender. A total of three Line Extenders can be connected to provide total coverage of up to 7,500 feet.